I probably have as many memories of my mother telling me how she ate brown beans and cornbread as a child as she does instances of eating them. From what I understand, the humble meal was a staple among those living in West Virginia who were not financially well-off. Sometimes, they only had sliced white bread with their beans. To hear her tell it, though, you’d think she had eaten a meal fit for a queen such was her childhood love of brown beans and cornbread. Even her cousin, Ellen, and my Great Aunt Edie, also a former resident of West Virginia, speak of the meal as if it was manna from Heaven. I grew up eating brown beans and cornbread though not with as much enthusiasm as my mother. They were okay, but as a child of the seventies, hotdogs, grilled cheese, and Kraft macaroni and cheese rounded out much of my diet. Besides, I was a somewhat finicky eater as a kid, and my appreciation for brown beans and cornbread didn’t develop until I was an adult. Now when Mom makes a pot of brown beans and a skillet of cornbread, you can bet my family, her cousin, Aunt Edie, and other relatives will trail in throughout the dinner hour to dine on the simple fare. With all that being said, it just made sense to have Bea Turner serve brown beans and cornbread at the diner she owned. My protagonist, John Welles, had to eat them at least once during his sojourn in West Virginia. Even though the meal is mentioned only once in my novel, I suspect Dr. Welles developed a love for brown beans and cornbread and probably ate them quite often. The recipe for brown beans is kind of like those for apple pie, meatloaf, or macaroni and cheese. Every family has their version of how the old familiar dish should taste. Often, finances dictated what went into the pot. 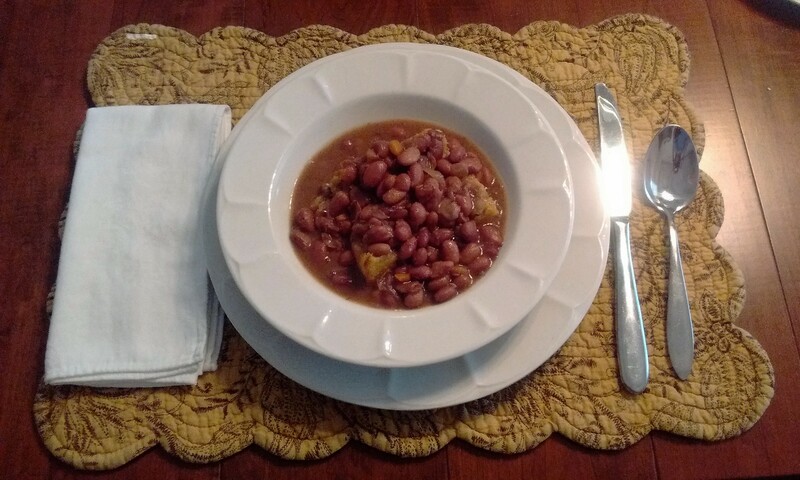 At its most basic, brown beans were cooked in water with either a piece of salt pork or dollop of bacon grease, salt and pepper. I’m going to provide a recipe that is a little more elegant but not alter it so much that connoisseurs of the dish won’t recognize it. Cover the beans with enough cold water to allow for absorption and soak overnight. Drain and wash the next day. Place the beans in a Dutch oven with all the remaining ingredients and bring to a boil. Reduce to a simmer and cook for 1 1/2 hours. Test for doneness at this point, and cook in thirty minute increments until the beans are tender, probably no more than 2 – 2 ½ hours total cooking time. Ladle the beans over slabs of cornbread and serve. That there is some mighty fine eatin’, Andy. clever title and wonderfully written, as always! Thanks, Rosita! I’m glad you enjoyed it.